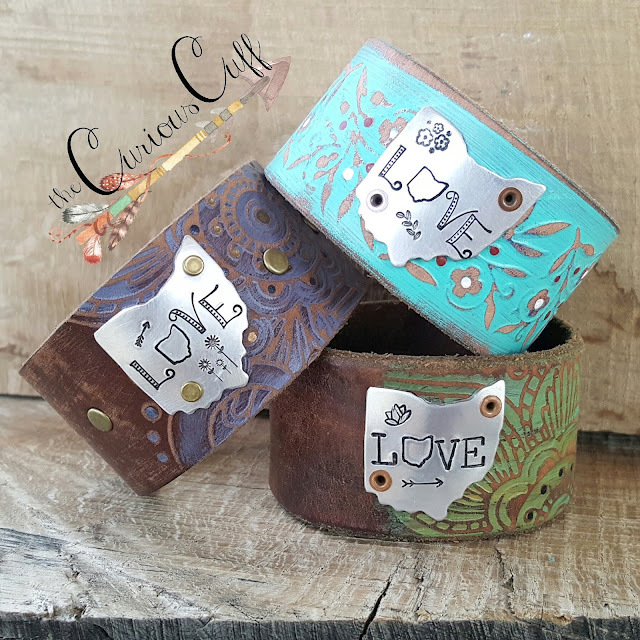 Meet this vintage, repurposing, metal stamping artist Leslie of the Curious Cuff. Can we just say how much we adore her style? Leslie is super creative with her pieces being fun, happy and positive. Her choice of colors, creativity in repurposing vintage belts and adding her flair, are uh-mazing. Keep up the awesome work Leslie!! I am the maker and creator of "The Curious Cuff". 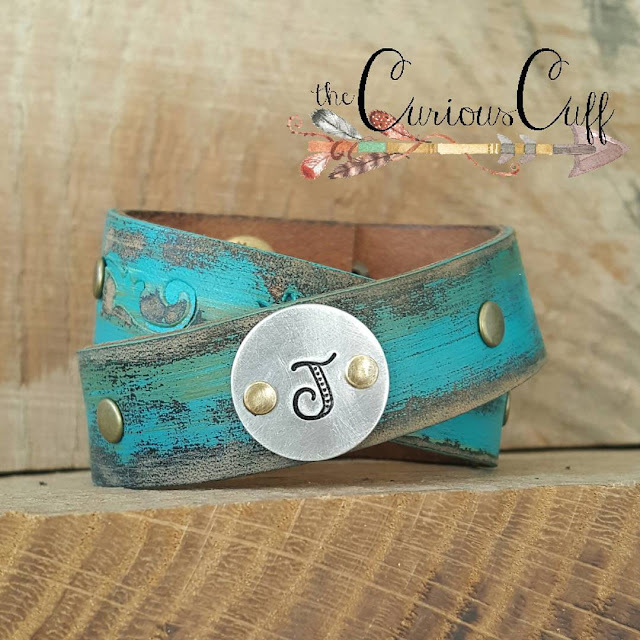 I take used and vintage belts and repurpose them into the coolest cuffs! Some leather I emboss and/or paint with special leather paint that is flexible and won't crack..some leather is awesome just the way it is..a deconstructed patina that only time and wear can create. When I first started stamping on metal..things tended to fly across the room and a few bad words were said..but I kept at it and continued watching Beaducation videos for tips and tricks which helped me a lot too! I view my cuffs like a tattoo on leather..each one is personal and tells a story...or is just really cool looking! My favorite thing to make is a custom creation. I love working with the person figuring out just the right leather, metal and words. Its very fulfilling when it arrives in the mail and they message me with how much they love it! When I'm making cuffs I'm making HAPPY happen! 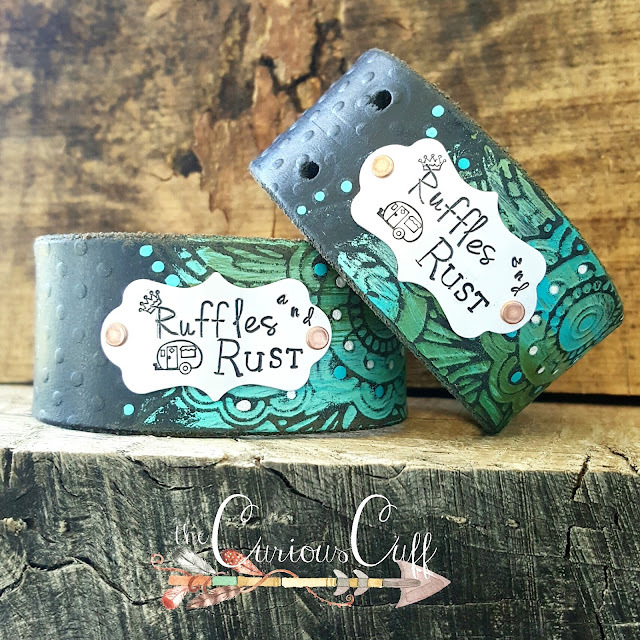 To learn more about Leslie or to purchase one of her fabulous cuffs, visit her on her website, Etsy site, the Curious Cuff or follow her on Instagram. 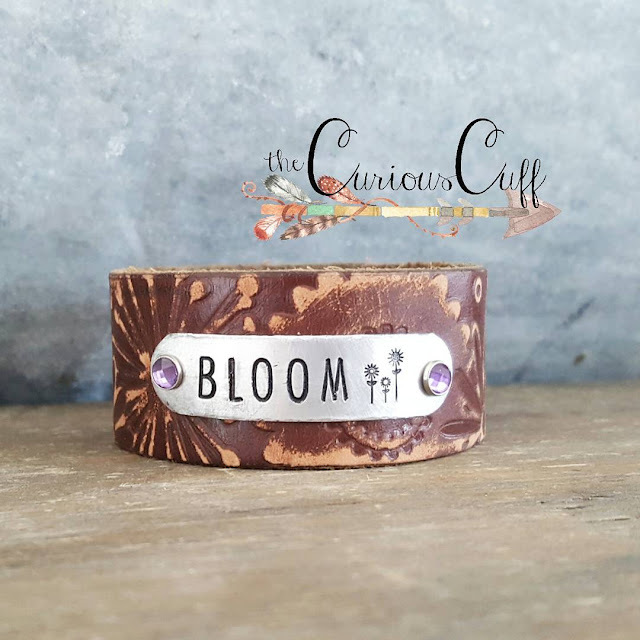 I have many Curious Cuff originals and I love them all. Leslie is so fun to work with, she takes your ideas or comes up with something for you. Either way your will receive a wonderful piece of art from past that you will cherish! Lovely! Can you share what fonts those are? Leslie is not only an AMAZING artist, but a beautiful person as well. She worked with my husband to create a custom cuff which I just adore! Since then, I have become a regular cuff addict!! Creativity and quality like this is hard to come by!